Lovamahapaya was once a majestic palace with roofs covered with copper-bronze plates, the inner walls studded with precious stones and had a massive 150 feet heighted building with 9 storeys. Hence it is called ‘Brazen palace’. It had 40 rows, each containing 40 stone pillars that equaled to 1600 in all, encircled the building. 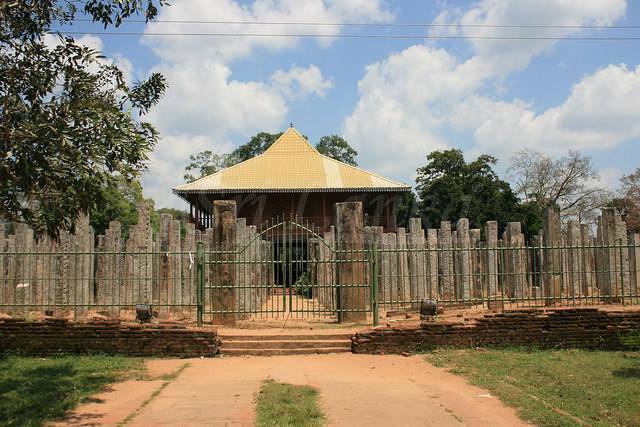 It was built by king Devanampiyatissa, the first Buddhist king and redesigned by king Dutugemunu. The construction of this once-glittering palace took a period of 6 years. The glory of this building was lost in the later years when it was, not once but many times, targeted by the enemies and destroyed. According to the Chronicle of Sinhalese, Mahavansa, this palace was completely destroyed in fire during the reign of King Saddhatissa. What stands today is a reconstructed building but the pillars around it are the same old ones. The striking 1600 pillars are the highlight of this place which must be seen while your stay in Anuradhapura.